Each year millions of Muslims converge in the Holy city of Makkah for the Hajj (Pilgrimage). The vast ocean of pilgrims are drawn from across the globe; people of all countries and all races join together in a bond of brotherhood, clad in two simple pieces of cloth; class status and vanity is all but eliminated. They embark on a spiritual journey to Holy sites of Makkah and surrounding areas that have witnessed God’s love and blessings. The Hajj is the fifth pillar of Islam. If circumstances permit, it is obligatory on every able-bodied Muslim to carry out the Hajj at least once in his or her life. The Holy Ka’ba has been a place of worship since the time of Prophet Adam (peace be on him) and is believed to be the first ever house built for the worship of God. It was later restored by Prophet Abraham and his son Ishmael (peace be on them). It was established for the benefit of the whole of mankind, to act as a centre for the unification of humanity. Muslims gather in dedication to Islam’s core message of uniting mankind under One God. Thus, the Hajj is an opportunity for spiritual purification to reinforce the Islamic teaching of brotherhood and equality of mankind, irrespective of status, race or colour. The institution of Hajj can be traced back to the time of Abraham (peace be upon him). But there are very clear statements in the Quran describing it as an ancient institution, starting from times immemorial when the first House of God was built in Makkah. During the occasion of Hajj, Muslims stand as one community, before one God, following one religion, one Prophet (peace be on him), and one Book, with the Ka’ba as the spiritual centre for the whole of mankind. It is performed on set dates of the Islamic calendar, it commences from the 8th of Dhul-Hijjah, the last month of the Islamic lunar calendar, until the 12th or 13th of the same month. Pilgrims prepare for the Hajj by performing ablution or taking a bath, and draping their bodies in a garment consisting of two white sheets, one each to cover the upper and lower body. These shroud-like unsewn sheets symbolises the death of worldly desires and the universal dress code is meant to display the equality of humans in the sight of God. At the end of the Hajj, Eid-ul-Adha (Festival of Sacrifice) is celebrated to commemorate the obedience of Prophet Abraham and his son Ishmael (peace be on them) to the commandment of Allah. Muslims are reminded of Prophet Abraham’s (peace be on him) patience, loyalty and obedience to God, while remembering God’s love for mankind. Prophet Abraham (peace be on him) had a series of dreams in which he saw himself sacrificing his eldest son Ishmael. He inferred that it was perhaps the will of God that he should sacrifice the life of his son. Prophet Abraham (peace be on him), being most obedient to God, was about to sacrifice the life of his son Ishmael, (peace be on him) when God commanded him to stop and gave him the good news: ‘’You have indeed already fulfilled the dream’’ (Holy Quran, Ch.37;V.106) which shows that Abraham was not required to fulfil his vision in actual fact, but it was only a practical demonstration of his intention and preparedness to slaughter his son which was desired of him. The vision had already symbolically been fulfilled when Hagar, the wife of Abraham and his son Ishmael were left by Abraham (peace be upon them) in the valley of Makkah which was at that time was an arid and barren land. The leaving behind of a weak and helpless woman with a child, in a place completely devoid of all signs of life and even of water or any other means of subsistence did indeed constitute a great sacrifice on the part of the noble Patriarch. It is worth mentioning that the sacrifice of human beings was much in vogue at that time. But when Abraham (peace be upon him) set about to fulfil literally this vision by making his son Ishmael lie down and laying the knife at his throat, God prohibited him from doing so. Thus the practice of offering human beings as sacrifice became forever banned to the followers of God. As a result of Abraham’s loyalty and obedience God was so pleased with him that He multiplied his progeny into billions. He was also given the great honour of being the forefather of the Holy Prophet of Islam (peace and blessings of Allah be on him). …….O People, it is true that you have certain rights over your women, but they also have rights over you. Remember that you have taken them as your wives only under God’s trust and with His permission. If they abide by your right, then to them belongs the right to be fed and clothed in kindness. Treat your women well and be kind to them, for they are your partners and committed helpers……..
All mankind is from Adam and Eve, an Arab has no superiority over a non-Arab nor does a non-Arab have any superiority over an Arab; also a white has no superiority over a black nor does a black have any superiority over white except by piety and good action. Learn that every Muslim is a brother to every Muslim and that the Muslims constitute one brotherhood. In conclusion, the annual pilgrimage to Makkah provides an opportunity for Muslims to strengthen their relationship with God and to be at peace with Him and His creation. 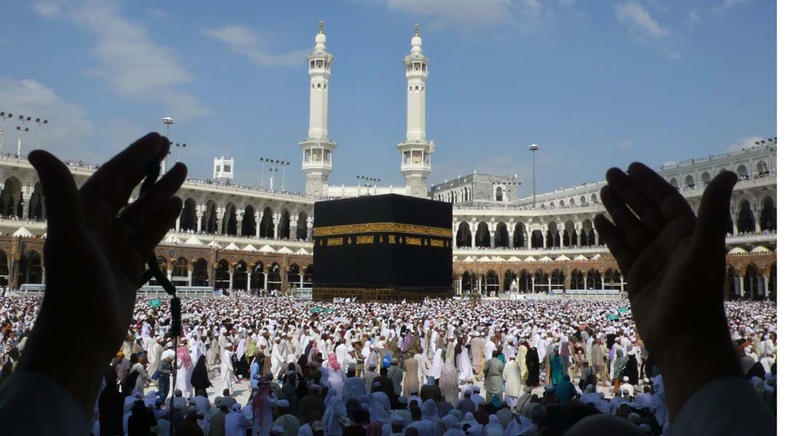 Share the post "The Hajj: One Of The World’s Largest Annual Pilgrimages"